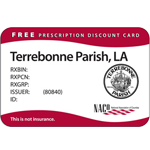 Terrebonne Parish Consolidated Government launched a discount card program on November 17, 2008 to help consumers cope with the high price of prescription drugs. The parish is making free prescription drug discount cards available under a program sponsored by the National Association of Counties (NACo) that offers average savings of 20 percent off the retail price of commonly prescribed drugs. The cards may be used by all parish residents, regardless of age, income, or existing health coverage, and are accepted at a number of the parish's pharmacies. A national network of more than 59,000 participating retail pharmacies also will honor the NACo prescription discount card. Terrebonne Parish is proud to be one of the parishes nationwide participating with NACo. The NACo prescription discount card offers significant savings for the uninsured and underinsured residents of our parish, and even those fortunate to have prescription coverage can use the card to save money on drugs that are not covered by their health plan. Residents do not have to be Medicare beneficiaries to be eligible for this program. Best of all, there is no cost to parish taxpayers for NACo and Terrebonne Parish Consolidated Government to make these money saving cards available to our residents. Cards will be available at several sites parishwide (see below for a complete list of locations). Parish residents can call toll free 1-877-321-2652 or visit www.caremark.com/naco for assistance with the program. The National Association of Counties (NACo) is the only national organization that represents county governments in the United States. Founded in 1935, NACo provides essential services to the nation's 3,066 counties. NACo advances issues with a unified voice before the federal government, improves the public's understanding of county government, assists counties in finding and sharing innovative solutions through education and research, and provides value-added services to save counties and taxpayers money. For more information about NACo, visit www.naco.org.